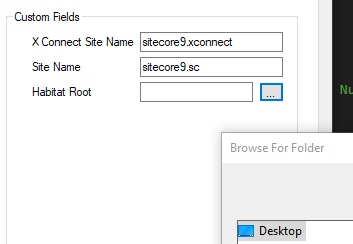 Home / Habitat / SIF / SIFless / Sitecore / Sitecore 9 / SIF-less 2 Beta 3 – Now with Habitat! Easy enough. How do you set this up? Pretty easy, actually When creating a new Sitecore Profile, check the Topology list after selecting the 9.0 Update 2 Version. Once you have the profile setup, select it from the Main window in SIF-less and you’ll see the Habitat Root field pop up. Simply select the folder which you’ve unzipped the source to. This folder you select should have the web.config, gulpfile.js, etc in it. After that, generate your EZ file and run it. Point the custom field “Habitat Folder” at the folder you unzipped to in Step 2. Generate the EZ file and run it. As per the usual, you can find the download the zip here. PS: I’ve addressed an issue with the length of the passwords for the alternate accounts. You can read about the SO here. 2 Responses to SIF-less 2 Beta 3 – Now with Habitat! When will you add Sitecore 9.1? Coming this week, hopefully today or tomorrow!